On 20–27 July 2010 the XIth general assembly of the World Lutheran Federation (WLF) was held in Stuttgart (Germany). 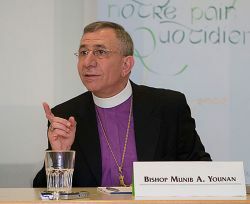 The delegates elected bishop Munib Younan of Jerusalem as the new president of the 70 million Lutherans in the world. On 18–27 June 2010 at Grand Rapids, Michigan, was created the World Communion of Reformed Churches (WCRC). On 20–27 July 2010 the XIth general assembly of the World Lutheran Federation (WLF) was held in Stuttgart (Germany). The delegates elected bishop Munib Younan of Jerusalem, of the Lutheran Evangelical Church in Jordania and in the Holy Land, as the new president of the 70 million Lutherans in the world. At the close of a long process of purification of memory and of reconciliation, during this assembly the WLF officially asked pardon of God and of Mennonite communities for the severe persecution inflicted by Lutherans against Anabaptists in the period of the Reform. On 18–27 June 2010 at Grand Rapids, Michigan, was created the World Communion of Reformed Churches (WCRC). This organization groups in a federation the principal Reformed Churches at an international level, for a total of 80 million faithful. The WCRC arises from the fusion of two branches of Reformed Churches: the World Reformed Alliance and the Reformed Ecumenical Council. The strong ecclesiological identity of the WCRC, as asserted by the name of Communion, and a more solid theological base than that of preceding organizations will permit this body to take a more active part in the ecumenical dialogue on the world level, in particular with the Lutheran tradition.